We were honoured to welcome Juno and Governor General Award winning composer R Murray Schafer to Huntsville for Nuit Blanche North. Over the course of the weekend we celebrated this pioneer of Canadian Music through different events and performances. It was a one of a kind chance to meet one of Canada’s greatest musical legends! 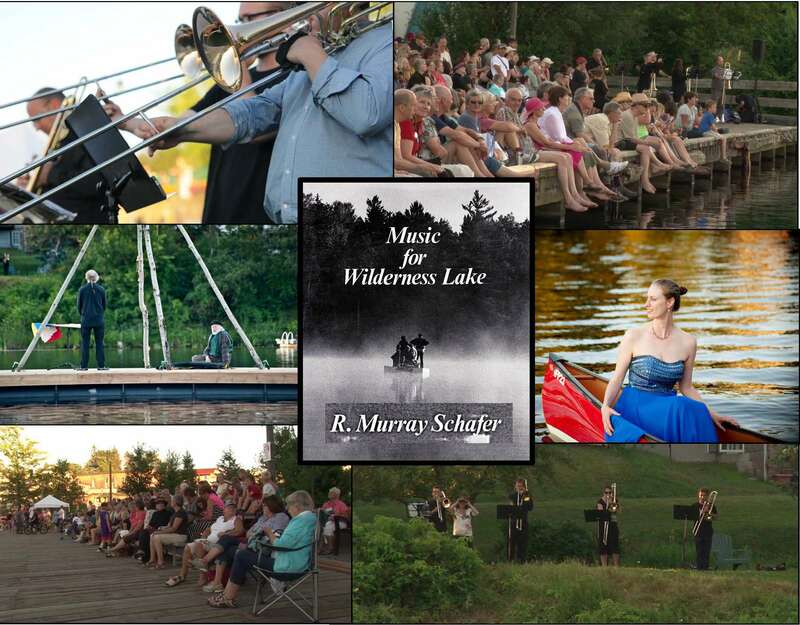 As the morning sun rose, and the evening sun set, Music for Wilderness Lake brought twelve trombonists into harmony with the waters and the shores of Muskoka. Musicians surrounded the Muskoka River near the Town Docks while conductor David Buley directed the music from a raft floating in the middle of it, while the natural inhabitants around the river responded and contributed to the music in their own way. The piece was written in two parts to be played at specific times of the day. “Dawn” was played at 7am, and was followed by a Free 20 minute yoga session provided by Ahimsa Yoga Studio and some fresh coffee and tea from Seven Main Cafe. Later “Dusk” was played at 8pm to kick off the Nuit Blanche North event. The music was joined by special guest, Soprano, Brooke Dufton, singing Schafer’s Aria from “The Princess of the Stars” and included the unveiling of a number of epic scarecrow sculptures floating on rafts created by long time Schafer collaborator Thom Sokoloski. 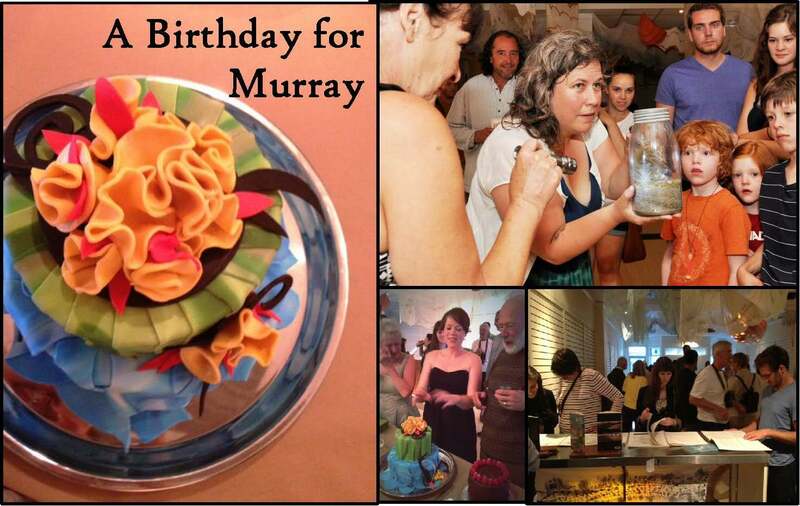 We held a very special VIP Birthday party in honour of R Murray Schafer’s 80 years on this planet. Party Guests meton the steps of town Hall. From there, they were led on a short voyage over land and water to experience a number of performances and works of art inspired by the Mr. Schafer’s career. Following this, guests had the chance to participate in a Q&A with Mr. Schafer, a sneak peek at an exhibit of his compositions and designs, and of course, what Birthday would be complete without cake. 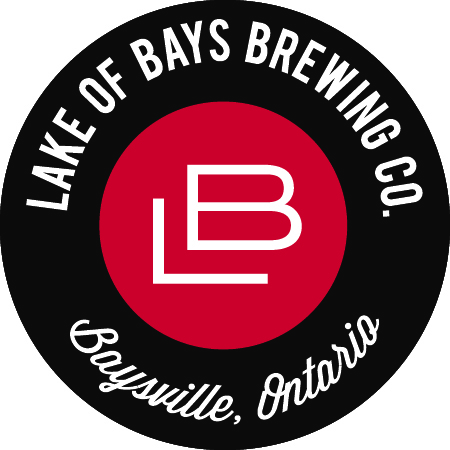 Beer (courtesy of Lake of Bays Brewery: Official beer of Nuit Blanche North), wine and non-alcoholic drinks were also be served (proof of age required). Want to know more about R Murray Schafer? Click on the links below.